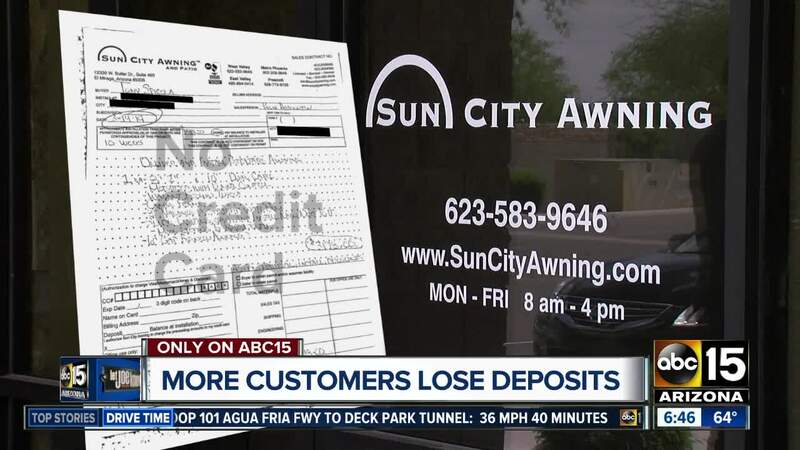 Sun City Awning in El Mirage shut its doors saying it was "forced to close." EL MIRAGE, AZ — A closing Valley business is leaving customers out of thousands of dollars. But many customers had given large upfront deposits. Most of them paid half without having any work done. That's far too much money upfront, even for a business that looked solid if you checked them out. Just weeks ago, Sun City Awning had a great rating with the Better Business Bureau. They also had no visible complaints with the Registrar of Contractors. Now, there are 13 complaints. Owner Brian Beachy sent a letter to customers saying they were filing for bankruptcy protection. He also said he's "initiated a plan with suppliers... to get your product to you." I called one of the suppliers, Eclipse Shading Systems, in New York. They say they're trying to help up to 40 customers. But, the company also says Beachy did not give them money towards any future systems. They say everything paid for has already been delivered, and they say Beachy has owed them money for a while. One of the Sun City Awning customers told me he tried to use a credit card to pay. That way, he may have been able to get his money back now. But he says the business insisted he pay with a check instead. If you're a Sun City Awning customer, let me know. I will put you in touch with this supplier and see if you too can get some help. And if you face big deposits, remember what happened here. Try to pay less up front and insist on using a credit card in case what happened here, happens to you.